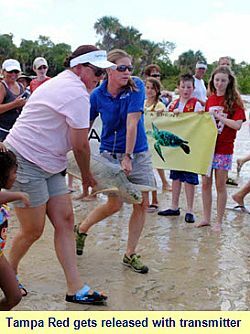 The Florida Aquarium and the Tampa Bay Green Consortium have successfully released their rescued Kemp's Ridley Sea Turtle named "Tampa Red" and entered her into the Tour de Turtles: A Sea Turtle Migration Marathon. Tampa Red is the first rescued and rehabilitated turtle to participate in the Tour de Turtles. Joining her in the "marathon race" are 10 other turtles starting at various locations, to include four turtles from Melbourne, Florida, two from Panama, two from Costa Rica, and two from the Caribbean island of Nevis. All the turtles will have a Platform Terminal Transmitter (PTT) attached to their backs. As the turtles travel from their nesting sites to unknown feeding grounds, researchers will track them by satellite technology gathering vital information that will help conservationists and governing agencies make informed decisions about conservation methods and policies. The turtle that swims the furthest distance will be named the winner. Similar to a human marathon, each turtle will also be swimming to raise awareness about a particular "Cause" or threat to sea turtle survival. This secondary competition, known as the Causes Challenge, is designed to see which turtle can generate the most support for their Cause. Tampa Red's cause is one embraced by The Florida Aquarium and the Tampa Bay Green Consortium aimed at raising awareness about boat strikes, which is widely acknowledged as a significant threat to sea turtles and other marine animals. Classrooms within the Tampa Bay area can help Tampa Red and her cause by adopting this turtle online. The focal point of the event is the marathon itself, which utilizes interactive online maps, videos and games to show the migratory movements and distances traveled by each of the participating turtles. From a dedicated webpage, students will be able to get to know Tampa Red, learn more about threats to her survival, and hear periodic interviews with turtle scientists.